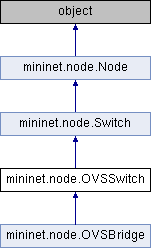 Make sure Open vSwitch is installed and working. Is OVS ersion < 1.10? Are we connected to at least one of our controllers? Return OVS interface options for intf. Start up a new OVS OpenFlow switch using ovs-vsctl. Shut down a list of OVS switches. Return ovsdb UUIDs for our controllers. Unfortunately OVS and Mininet are fighting over tc queuing disciplines. As a quick hack/ workaround, we clear OVS's and reapply our own.